SYRACUSE — The Syracuse-Wawasee Rotary Club is holding a food drive this month for food pantries in Syracuse and North Webster. 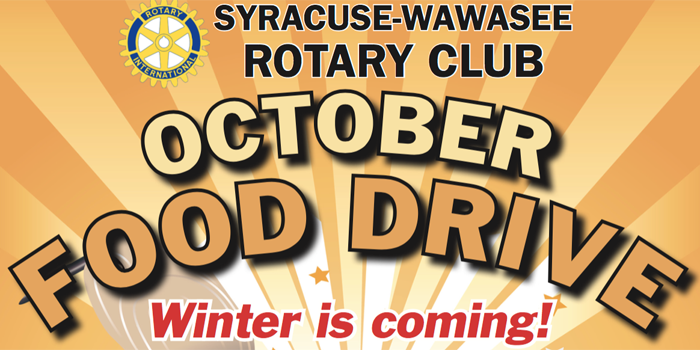 Winter is quickly approaching, and the Syracuse-Wawasee Rotary Club wants to make sure that no one in the community goes without food. Drop-off locations for food donations include Shopko, Dynamic Spine and Rehab Center, Key Bank, Bowen Center, Crossroads Bank, Lake City Bank, and Mutual Bank. Both Lake City and Mutual Bank branches in Syracuse and North Webster are participating in the food drive.